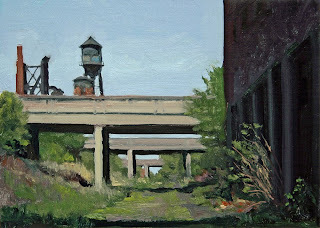 oil on linen/panel, 2009, 5x7"
This daily painting is a view of the Dequindre Cut looking North towards Eastern Market. 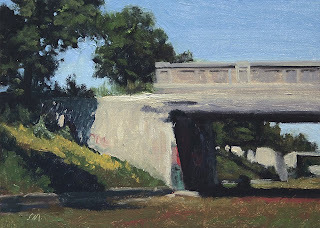 This section of the greenway development has not yet been completed. The section completed has a 20-foot-wide paved pathway, which includes separate lanes for pedestrian and bicycle traffic. It is really cool with some great graffiti . 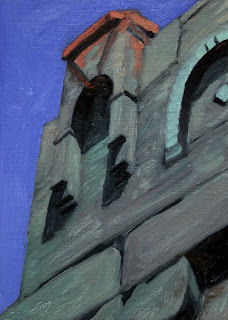 This daily painting is of an interesting building in Detroit. There are so many of these single story buildings all over Detroit. 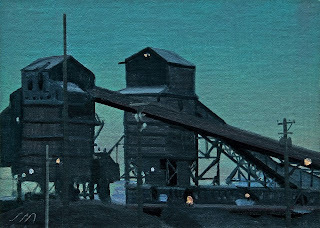 Couldn't resist the colors in this one. 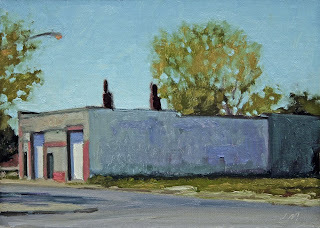 This daily painting is of a lonely building on Michigan Ave in Detroit. There are so many of these abandoned single story buildings all over Detroit, waiting for better times. 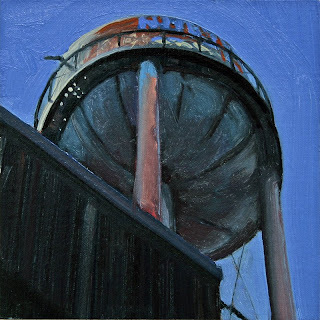 This daily painting is of a warehouse district watertank as seen from below. 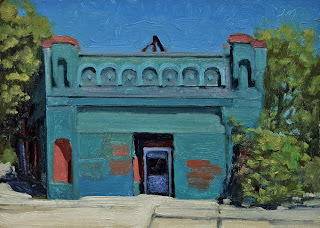 This daily painting is of an interesting building on Van Dyke Rd. 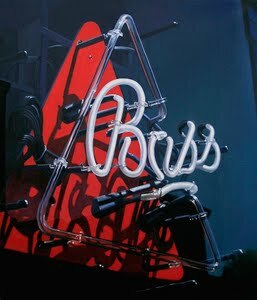 I really like the contrast of light and shadow. 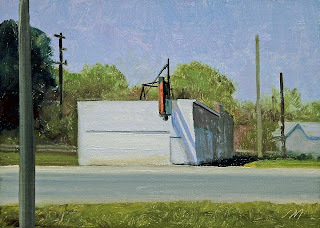 This daily painting is of an urban green house as seen from the expressway. I like this view looking up from the road below. 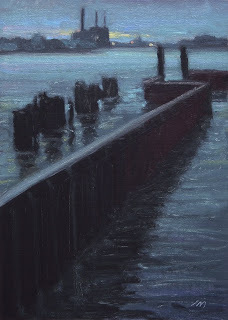 oil on linen/panel, 2009, 5x5"
This daily painting is a nocturne of the Detroit River from the Detroit side along the riverwalk. 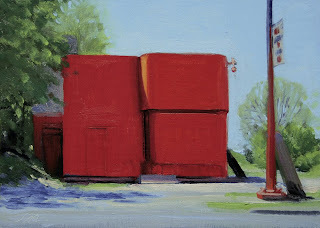 This daily painting is of some brightly colored channel markers catching some rays behind the Coast Guard Station. Such great contrast is hard for me to pass up. They look like wooden tops from another era. 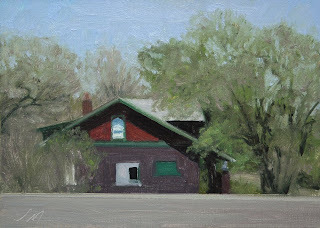 This daily painting is of the dark building behind the Detroit Elevator Co. building in yesterday's painting. 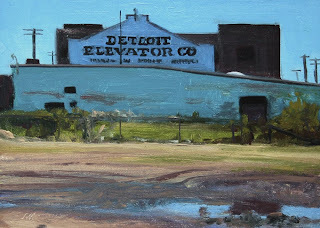 This daily painting is of the Detroit Elevator Co. A building at the entrance to the Dequindre Cut, near the Detroit River. 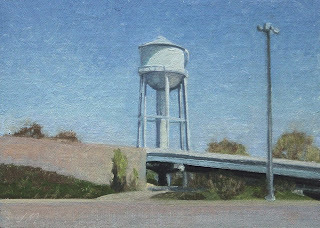 I really like blue so this one was easy for me. 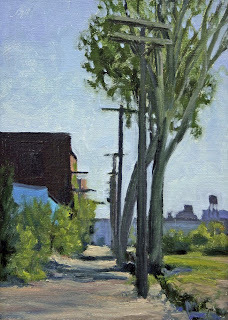 This daily painting is a view of the Dequindre Cut, a new greenway park in Detroit. 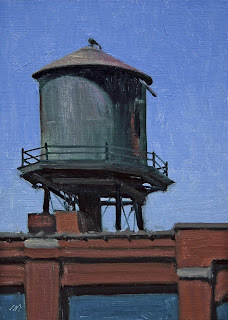 This daily painting is of a watertank in downtown Detroit warehouse district. 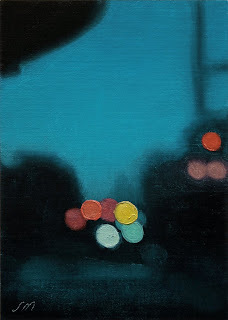 This daily painting is the 600th Postcard from Detroit. 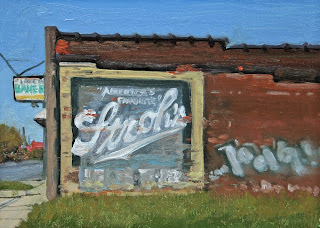 It is of a Stroh's sign painted on the side of the Cloverleaf Bakery in North Detroit. 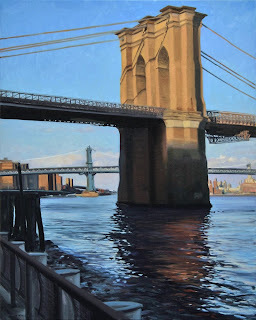 Please see the interview of my show at the George Billis Gallery in NY . 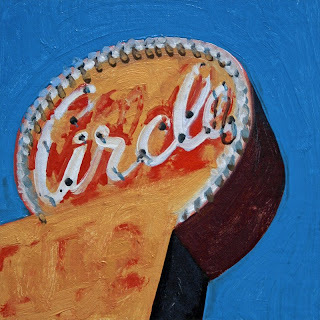 It represents the strength and grit of Detroit's industry. 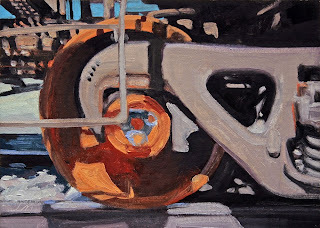 This daily painting is of a detail of a train wheel with shadows. 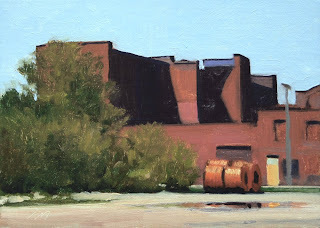 This daily painting is of a section of the vast Rouge Steel Plant along the Detroit River. 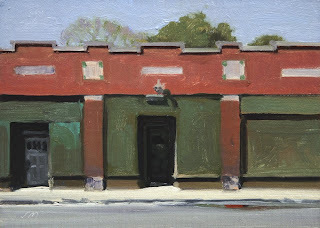 This daily painting is of a red storefront on Hamilton Street in Detroit. 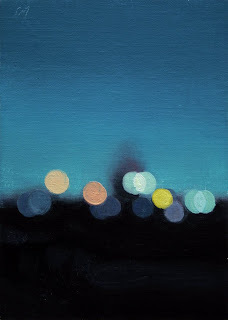 This daily oil painting is the latest in the Citylight series of Detroit paintings. And is another view of Woodward Ave. 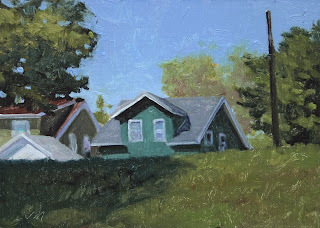 This daily painting is of of an interesting colored house seen from the road. 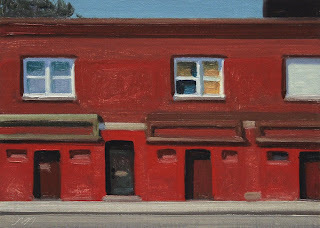 This was taken yesterday after dropping off a small painting for The Grand Bazaar, the fourth Annual Benefit for Museum of Contemporary Art Detroit (MOCAD), being held on Friday, May 8, 2009. Please stop by if you can. 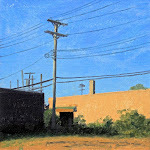 When I figure out how to download the pictures from my cellphone I will post a couple pictures from the opening. 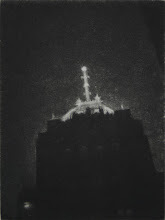 It was a great opening and I had a great time. 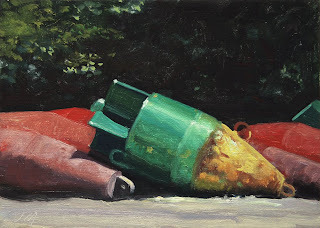 The daily painting fans were well represented. Thanks to all that made the night a great success.